The manufacturer with the most experience. The film that’s been through hundreds of changes and improvements in it’s lifetime. It protects your vehicle’s paint from unsightly damage and maximizes resale value. Some of its features include Self Healing, Stain Resistance and Great Optical Clarity. 3M is really the grandfather company to the entire automotive Paint Protection Film industry. The whole technology for automotive Paint Protection Film was actually developed by 3M in partnership with the US military during the Vietnam War, because the military needed a lightweight way to protect helicopter blades from getting damaged. 3M developed the urethane film technology that evolved to protect NASCAR vehicles on the track and then any consumer automobile on the road. So 3M has been in this game the longest, and they have a good track record of creating a quality film. 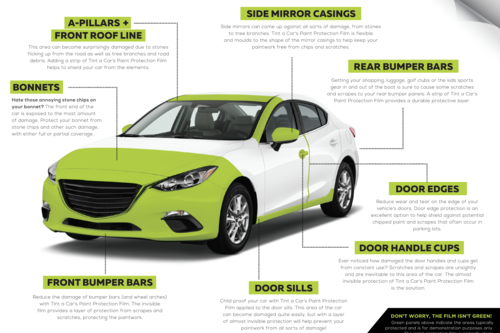 Your vehicle has a few select areas which are deemed “high impact.” Our most popular packages include the front bumper, hood, fenders, and mirrors. People looking for extra protection will typically add on rockers, headlights, door edges, and door handles for maximum protection. Pretty much every painted surface on the exterior of your vehicle can be wrapped with 3M Scotchgard clear bra. The choice is yours. 3M offers an amazing warranty with an optional 5 year paint warranty. With all other manufacturers the warranty simply covers the film failing, but with 3M you can add a warranty to cover chips that penetrate the film and damage the paint underneath. We believe this is a huge benefit to 3M Scotchgard Pro.